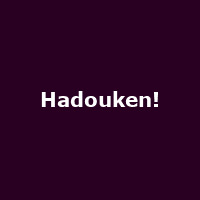 Grimy five-piece Hadouken! have announced details of several dates to follow their one-off London show at the end of July. The band, who originally hail from Leeds, are currently working on their second album (which will apparently have no computer game sounds anywhere on it!) in Holland and will play a string of gigs later in the year. Kicking-off the shows at Derby's University Academy on September 22nd, Hadouken! will continue on to Manchester's Moho before hitting up venues in Liverpool, Preston, Norwich, Hatfield (Herts), Leeds, Birmingham and finally Sheffield on October 4th. The energetic dance-indie fivesome are to play numerous European festivals this summer including the Stagedive Day Out (Sweden), London's Underage Festival and - as if that wasn't enough, they will support legendary DJ Tiesto at his Victoria Park gig at the end of July. Tickets for the September/October shows are available now for £12-13 each + booking.